The rodeo crafts fair included work by a prison artist with a gift for caricature. 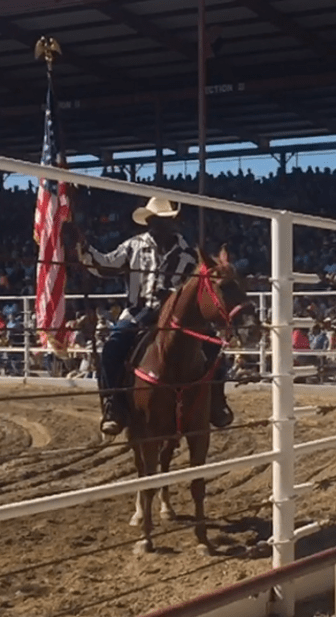 I spent three days at this year’s Angola prison rodeo expecting to write a biting condemnation. I would highlight the rodeo’s gladiatorial nature, the exploitation of prisoners on a former slave plantation, a mostly white audience watching black inmates get thrown around the ring and gored by bulls. To my surprise, it wasn’t so easy to make a decisive denunciation. I had a difficult time untangling the grotesque nature of a prison rodeo from the brutality of a regular rodeo. Were the audience members there to see prisoners injured and humiliated, or do people always attend rodeos to see someone brutalized? I couldn’t tell. I also couldn’t talk to any of the inmate participants to see how they felt. Every attempt to communicate was quickly interrupted by a prison guard telling me to move along. The Louisiana State Penitentiary at Angola stages its annual rodeo every Sunday in October. Many inmates’ families and friends are in attendance, seemingly enjoying the chance to see their loved ones compete. Perhaps the rodeo provides a moment of normalcy in an otherwise nightmarish situation. Ultimately what I found to be the most intriguing and provocative aspect of the event was the art market that lies just outside the rodeo gates. Here, inmates trying to sell their crafts can converse freely with rodeo goers. 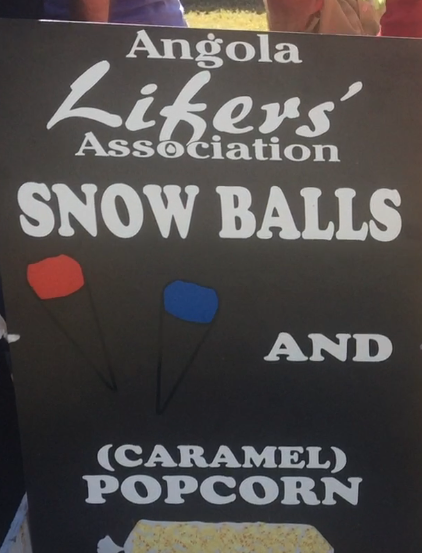 Some are permitted to walk among the fried dough stands and carousels while others, apparently less trustworthy, are kept behind a chain-link fence, with their handiwork displayed on tables accessible to the browsing public. 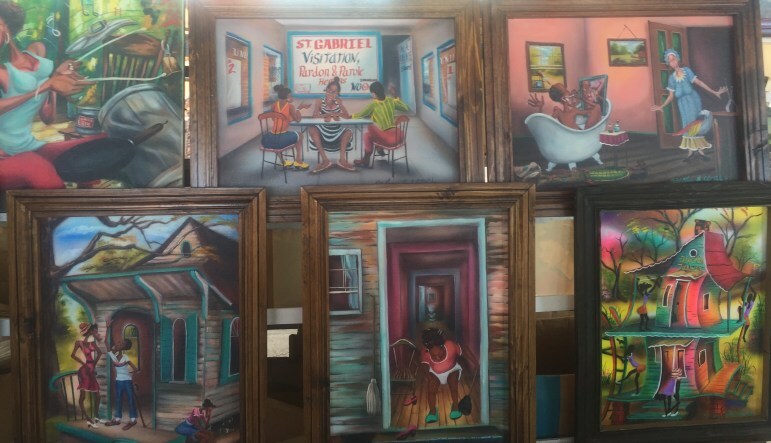 You can buy perfectly crafted lawn chairs, carved wooden bowls, grills made from scratch, and a better selection of paintings than you find at Jackson Square. The professional quality of the merchandise is only possible because of the wide array of vocational programs and educational opportunities offered to inmates. Angola partners with Louisiana Technical College to offer courses in automotive technology, carpentry, culinary arts, graphic communications, horticulture, and welding. Inmates can take part in activity clubs (including the award-winning prison magazine, the Angolite), join re-entry programs, earn a GED or even a bachelor’s degree in Christian ministry, via outreach from the Baptist Theological Seminary in New Orleans. For Angola’s inmates, these educational opportunities come far too late. Most will never be able to use their acquired skills in the outside world, as up to 90 percent will die in prison. Louisiana has the most draconian sentencing laws in the country. When tough-on-crime attitudes swept the U.S. in the 1970s and the federal government began incentivizing states to lock up their citizens, no state was more zealous than Louisiana. The irony of Louisiana’s prison system is that while Angola trains prisoners for future careers they’ll never have, inmates who will eventually re-enter society are almost entirely deprived of educational opportunity. Over the next few decades the state government passed a slew of legislation mandating harsh minimum sentences, three-strikes rules, and a “life means life” bill that removed any chance of parole for those with life sentences. Meanwhile, a criminal defendant could be convicted with as few as 10 out of 12 jury votes – a statute passed in 1880 to supply free labor to Louisiana’s emerging convict leasing system. This law still remains in effect. Today, Louisiana is the most incarcerating state in the most incarcerating country in the world. One out of 86 Louisianans, and one out of 14 black men from New Orleans, are in prison. More prisoners are serving life without parole than in any other state — 12 percent. And it isn’t just murderers who serve these sentences. One out of 10 Louisianans serving life was convicted of a non-violent crime. Many of the vendors at the Angola arts market are middle-aged or older. Inmates talk about what wood they like to work with, new welding methods they are innovating, their artistic method. It is hard to believe these 40-, 50-, 60-year-old men still pose a danger to anyone. In the United States, 5 percent of inmates are held in local prisons. In Louisiana, this figure is 52 percent. Most of Louisiana’s prisoners are held in rural sheriff’s jails; bare minimum facilities with the sole purpose of incapacitation. Inmates have nothing to do but sit on their bunks or in day rooms waiting — often for years — to rejoin society. Unprepared and burdened by the stigma of imprisonment, reentry comes with unending obstacles. Of the 15,000 convicts released in Louisiana every year, 11,000 come from these local prisons and nearly half will be back in prison within five years. The annual inmate rodeo draws thousands to Angola. This system of incarceration developed as a result of Louisiana’s bizarre form of prison entrepreneurship. In the 1990s, as prisons filled up and overcrowding became a constant issue, states had two options: build more prison beds or reduce the prison population. Louisiana’s politicians continued to run on “tough on crime” platforms and there was no political or social will to reduce the incarceration rate. But the state didn’t have the money to build new prisons, so it found an alternative: paying rural sheriffs to house inmates. Many northern parishes expanded their jails, encouraged by the influx of money and the state’s guarantee that it would keep the inmates flowing in from the South. Some parishes built the new facilities with local funds while others partnered with private prison companies in profit-sharing deals. For the state government, this system is a bargain. Local parishes receive $24.39 a day per inmate, compared to the per diem cost of $63.15 at Angola. But even with this low level of funding, sheriffs are allowed to skim off the top, taking money away from rehabilitation and using it to buy new police uniforms, squad cars, more deputies, military grade weapons, and laptops. The expanded prisons have become a major source of employment in many of these poor rural parishes. Louisiana sheriffs, powerful political figures and the face of criminal justice in many communities, have become a primary employer as well. It’s not to say that all sheriffs are evil; many care deeply about the well-being of their constituents. But this doesn’t change the fact that their re-election campaigns are reliant on the perpetuation of mass incarceration. The Sheriff’s Association of Louisiana is one of the most powerful lobbies in the state and continually blocks legislation that would reduce the prison population. Prison sentences, in other words, have become disconnected from the goals of crime reduction and justice. The motivation for incarceration is profit and political opportunism. Instead of taking care of all its citizens, Louisiana has pitted rural impoverished parishes and urban poor communities against each other. Like a seesaw of well-being, one’s profit is the other’s demise. Louisiana ranks as one of the three worst performing states in terms of poverty, income inequality, post-high school education, disconnected youth, hunger and food insecurity, child poverty, and healthcare coverage. It’s no wonder that rural communities aren’t quicker to stand in opposition to a system that provides their only consistent source of well-paying jobs. 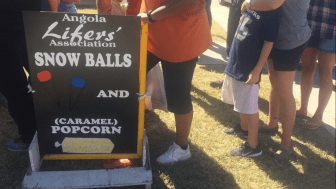 Rodeo goers line up at a sno-ball stand manned by Angola inmates serving life sentences. In the aftermath of Gov. Bobby Jindal’s fiscally incompetent administration, Louisiana is dealing with one of the worst budget shortfalls in state history, yet continues to spend over $500 million a year on incarceration. The budget deficit means budget cuts, and right now money is being taken out of K-12 education, healthcare, and college scholarships. Baton Rouge has also mandated a budget cut for prison expenditure. But the cut doesn’t trigger a reduction in the prison rate, it just allocates less money for each inmate, meaning fewer re-entry programs and medical services in Louisiana’s prisons. Even with all this costly incarceration, Louisiana continues to have one of the highest violent-crime rates in the country. Louisiana’s legislators need to accept what criminologists have been telling us for a long time: The key to crime deterrence isn’t incarceration, it’s a reduction in multidimensional poverty. As I walk out of the arts market I pass a car with the words, “GOING TO SEE MY DADDY!” written on the back windshield. It’s an apt reminder that arguments about financial efficacy mean nothing to a child whose father is behind bars. Whether serving life in Angola or five years in a sheriff’s jail, once you are in Louisiana’s criminal justice system your chances of rejoining society as a free citizen are slim. The government doesn’t truly aim for rehabilitation, nor does it care about an inmate’s chances at successful re-entry. A graduate of the University of Michigan with a degree in public policy, journalist Michael Stein lives in New Orleans. He is currently directing a documentary about structural violence in the city.